A Tribute to the Queen Mary’s 80 years! The RMS Queen Mary was first launched in 1936, constructed at the John Brown Shipyard in Scotland, she was the first ocean liner to carry the name of a reigning monarch, Her Majesty Queen Mary. The ultimate dream of Samuel Cunard was to have a trans-Atlantic service of two giant ships that crossed the Atlantic, offering a regularly scheduled transportation service of passengers and mail. In 1840 , Samuel Cunard launched the Britannia, a steam-powered sailing vessel, to carry passengers and mail between North America and Great Britain, but this was only one small ship and it still took weeks to cross the Atlantic. 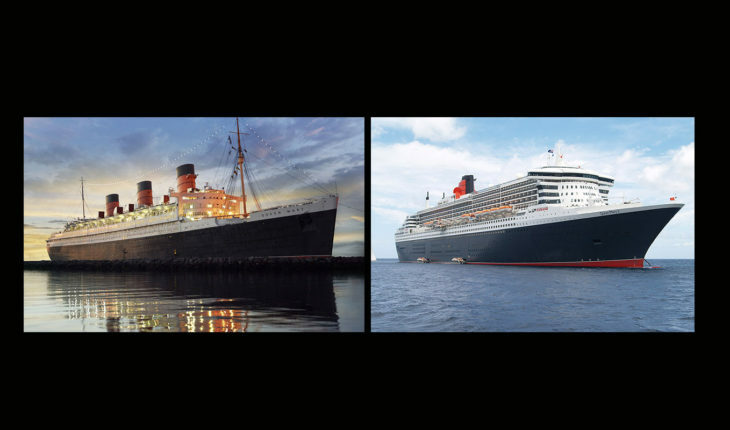 It wasn’t until after World War II that Samuel Cunard’s dream became a reality, when the Queen Mary and Queen Elizabeth crossed the Atlantic, often meeting in mid-Atlantic. These two giant ships, both over 1,000 feet long, made regularly-scheduled crossings, and their record of being on-time was only equal to a train schedule, that you could set your watch to. These were the days when the only way to cross the Atlantic was by ocean liner, and many passengers enjoyed these crossings in first-class accommodations. Both of the Queens, Mary and Elizabeth, in their art deco-style of decor, were considered the most comfortable and cozy way to make that trans-Atlantic crossing. 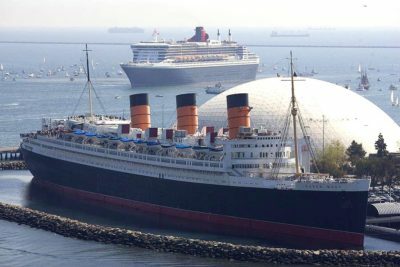 Today, sadly, only the Queen Mary continues to delight visitors every day in Long Beach, California while her sister, the Queen Elizabeth caught fire and burned in Hong Kong Harbor in 1972. Since 1970, the Queen Mary has been a landmark of Long Beach, California, in fact she has now been docked in Long Beach, longer than she was in-service at sea. The legacy of crossing the Atlantic on an ocean liner continued after the two giant Queens, Mary and Elizabeth were retired, as the Queen Elizabeth 2 took over that legendary trans-Atlantic experience in 1969. In 2004 while the aging QE2 continued trans-Atlantic service, one man, Micky Arison, had a vision to build another ocean liner to take-over the iconic voyage of a trans-Atlantic crossing, by building the Queen Mary 2. Many believed that the QE2 was truly the last trans-Atlantic ocean liner to ever be built, but Cunard surprised the world with the launch, in 2004, of the giant Queen Mary 2, a true ocean liner. The great iconic experience of a trans-Atlantic crossing is preserved as the QM2 continues to offer the legendary experience of a voyage across the Atlantic. Passengers today, can soak in the smells, the style, the music, the exquisite cuisine, the uncompromising comfort, and the culture of an Atlantic crossing on a true ocean liner, the Queen Mary 2. My passion and interest in ocean liners and cruise ships began after a family visit to the Queen Mary in Long Beach, California in 1977. I was so impacted by my visit that I started to build models of the Queen Mary and reading books about the famous ship. 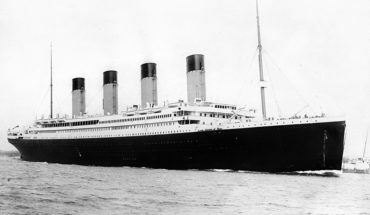 In my research, I discovered there was an entire fleet of ocean liners that were the only way to cross the Atlantic, ships like: the Titanic, Mauritania, Normandie, SS United States, and the Queen Elizabeth were just a few of the mammoth ships that were work-horses, transporting passengers back and forth across the Atlantic. Each ship had it’s own culture and experience. In fact what was truly fascinating during the trans-Atlantic era, there were “ships of state” meaning each country had their brand of ships, like the British ships, German ships, French ships, Italian ships, Dutch ships, and United States ships, all crossing the Atlantic carrying the culture of their country. The following three-part video series was filmed aboard the Queen Mary in Long Beach. 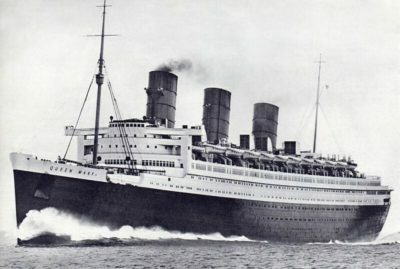 This article is a tribute to the incredible ocean liner, Queen Mary, a ship of dreams, nostalgia, history, romance and so much more. The Queen Mary has been a part of history for 80 years and in May of 2016, we celebrate this historic ship. I celebrate this ship, because if was my first visit to the Queen Mary in 1977 that sparked my interest in ocean liners and finally cruise ships. 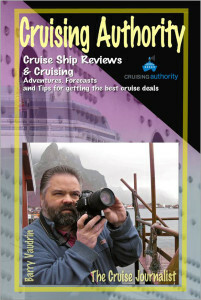 You can read my full story in my latest book Cruising Authority. 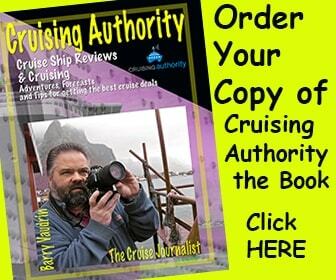 Best read from the deck chair on a cruise ship while at sea, Cruising Authority has the complete story of Barry Vaudrin’s journey working on cruise ships, and how he started his talkshow called Cruising Authority. 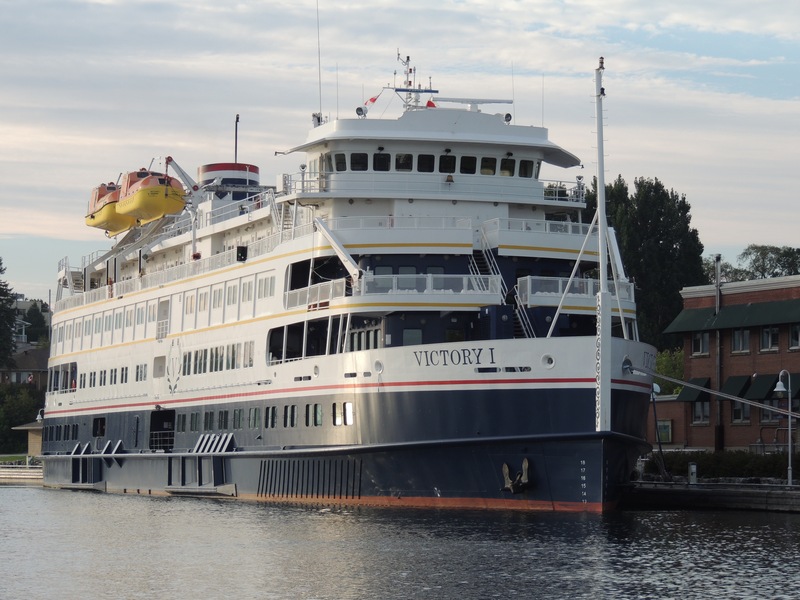 In this book are cruise tips and advice for choosing a cruise line, cruise ship, itinerary and how to get the best deals. 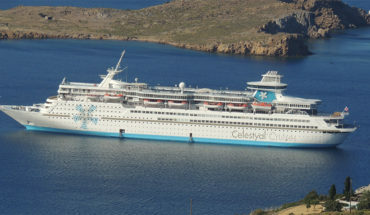 Read cruise reviews of fascinating ships and itineraries around the world.